Create the perfect look for your classroom with these Hanging Paper Fans! Coordinate with similar patterns and colors to make a chic environment. Use them to fill empty corners, accent work areas and learning centers, or design fabulous displays around your bulletin boards. 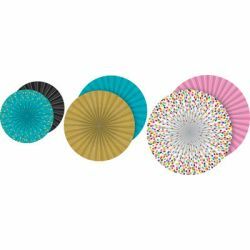 Includes 3 fans with a self-adhesive strip and string for hanging.